The Hermit card is numbered 9 in the Tarot. This card is one of the Major Arcana cards. The Hermit meaning is all about soul searching and finding true meaning. It can show a need for introspection and time alone for contemplation. 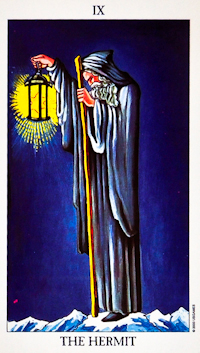 The Hermit card can also reflect an acceptance and understanding of things that can't be changed as well as wisdom, patience and a new appreciation of life. The Hermit can be advising in Tarot Readings and shows a need for care and consideration and thinking about problems before taking action. By drawing on your inner strength and guided wisdom you will find ways to get through any difficult times. The Hermit, as with all the Major Arcana can be a representative of an individual or aspect of a personality. The Tarot card meaning for this card can indicate someone who is perhaps older and wise with a gentle and thoughtful personality. It can also indicate someone who is born under the star sign of Virgo. 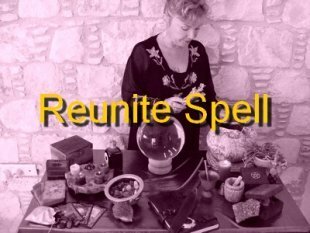 In questions concerning love and romance in Tarot Readings the appearance of the Hermit Tarot card can act as a warning to think carefully about a relationship. Is it moving forward or is it stagnant? For career or business questions asked in Tarot Readings the Hermit Tarot card often represents a time when things are running smoothly on the career front. It encourages working diligently and quietly behind the scenes to get the job done. In this way the Tarot card meaning can be heartening for career aspirations. When the Hermit has prominence in Tarot Readings it can indicate ignoring financial realities. The Tarot card meaning of the Hermit in questions of finance can show hidden problems that will eventually come to the surface. So if you are ignoring unpaid bills or piling up debts, the appearance of this card can act as a wake up call to do something about the problem. 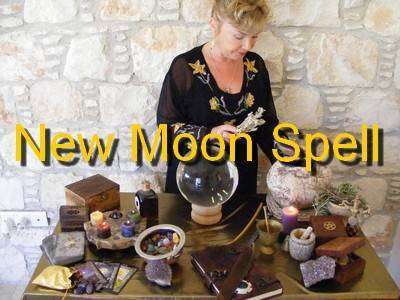 The Tarot card meaning for questions concerning health are usually connected with a need for rest and recuperation. Take time away from the hustle and bustle of day to day life to refresh and rejuvenate yourself. If the Hermit is prominent in a Tarot Spread it can show that you may need some time away to consider choices you need to make. Rather than being rushed and pushed into making hasty decisions that you may later regret you need time alone to really think about what is the best option for you. The reversed Tarot card meaning of the Hermit Tarot card can show that you have been too hasty and perhaps foolhardy or reckless. Another meaning of the reversed Hermit Tarot card is that of being stubborn and inflexible and a refusal to accept other points of you. This may be due to foolish pride and misplaced principles. The Tarot Hermit card can often show a need for addressing your future health, wealth and happiness. 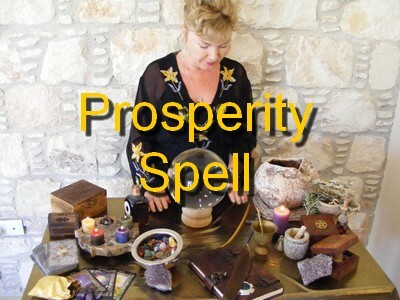 The most potent and powerful way to do this is by having a Prosperity Spell cast. I use Tarot cards in my Magic Spell Casting to change destiny for the better!! !